Packed with unforgettable sights and adventures, this mini vacation is perfect for the traveler that is eager to visit Denali National Park. The sights from the high, glass-domed deluxe railcars are a spectacular way to travel between destination points and enjoy the Alaska landscape. With three days and two nights, this tour offers you more time to explore the Denali area and take part in some of the optional excursions that make this area special. Flightsee to the impressive Denali, raft one of Alaska's glacial rivers or visit an Iditarod musher's dog kennel and learn about the importance of dog sled teams to Alaska history. Don't forget that Denali National Park is your best chance to view Alaska's famed wildlife: moose, bears, foxes and wolverines! Catch a glimpse of the elusive mountain, the "Great One." Enjoy dinner and a show at the Music of Denali Dinner Theater at McKinley Chalet Resort featuring family-style dining and a spirited original musical about the first men to reach the summit of Denali. This tour includes rail travel aboard luxury railcar to Denali National Park rail depot, transfer and baggage handling to and from a Denali area hotel, two overnights at the hotel and rail travel back to Anchorage. Enjoy an incomparable sightseeing experience aboard luxury glass-domed railcar. Take in the wide-open scenery as you travel through the Matanuska Valley, a farming region known for mammoth vegetables; past colorful towns like Wasilla, billed as the "Home of the Iditarod;" and along scenic rivers like the Susitna. By afternoon you'll arrive in Denali National Park. 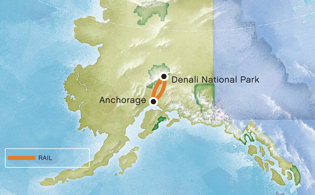 Enjoy a night at leisure and visit the tour desk for information on the array of optional activities available in Denali National Park and surrounding areas. Spend the night at a spacious Denali-area lodge located just a mile from the entrance to Denali National Park. Overnight Denali. Enjoy a morning at leisure. Later, re-board the train and journey between the spectacular Alaska and Talkeetna ranges, which feature several spectacular peaks and glaciers, before heading back to Anchorage.Accommodations not included Anchorage accommodations are not included on Day 3. Please call our Alaska Reservation Specialists to reserve your hotel. We'll be happy to recommend more sightseeing excursions.